Tire rotation the correct way! Many people who drive their vehicles on the road today do not know about rotating their tires. There are some people who may know that you need your tires rotated, but they do not know how so they take their vehicle to a shop and have them do it for a fee. This fee is money that could be kept in your pocket. Even for you avid backyard mechanics this can perhaps be a little refresher on the correct way to rotate your tires. Tire rotation can be accomplished by the average person in my opinion. I will discuss the steps on how to properly rotate your tires. I will start by describing why a person rotates their tires. The reason you rotate your tires on your vehicle is to prevent uneven wear on one tire. In my experience with working on some vehicles, and talking to instructors through school I have learned for a basic rule of thumb to rotate your tires every 6,000-8,000 miles. Another thing that may come with rotating your tires is balancing your tires; this is recommended to be done every 12,000-15,000 miles. For most people you will be unable to balance your own tires. This is not because tire balancing is difficult, it is simply due to the cost of the machines used. I will discuss in a future article how to use a tire balancing machine. Now back on track, the tire rotation will help keep your tires wearing even. This will allow all tires to hopefully have equal tread life, and prolong the life of your tires. The skills needed to rotate tires are few. I would say that the average person can easily rotate tires on their vehicle. You will need to know how to properly jack your vehicle up, how to loosen lug nuts, and how to set a tire on a hub. These are all simple tasks. The tools that are needed are pretty basic. You will need a jack of some sort. This can either be the jack from your trunk of your car or a floor jack. This 2 and 1/2 ton floor jack makes the job much easier. You will also need a lug nut wrench. This is usually found in the truck located with the spare tire. Next you will need to purchase if you don’t already have some jack stands. These 3 Ton jack stands work great. You will need to purchase two sets of the 3 Ton jack stands one for the front, and one set for the back. These should be all the tools you will need. NOTE: Before starting make sure that your tires are not directional. They will say on them! If they are you will have to take them to a garage to have them rotated. You are going to need to park your vehicle on a level surface, where it can sit for a couple of hours. Now make sure the car is in gear and block the back wheels. You can use two boards or two bricks, whatever you have. Just make sure to position the items in front and behind tight against one back wheel. Next you are going to want to take your socket set from above with your ratchet and crack loose all of the lug nuts on the front wheels. You just need to get them loose. Turn the wrench counter clock wise to loosen them. Now you are going to want to take your jack, this is easier if you use your 2 and 1/2 ton floor jack because it rolls, and position it under the car. You will need to look for a place to jack. Look for the cross member which is located under the oil pan and runs most of the width of the vehicle. You can jack on this or a part of the frame. Slowly jack the front of the vehicle up. Once you have the tires off the ground a ways place your 3 Ton jack stands one under each control arm. The control arm is located just inside of the tire, it should have a spring and strut or shock absorber attached in some way. Now lower the jack and make sure your tires are off the ground and that the car is not going to fall. Now move onto the back of the vehicle. Use your ratchet and socket to break loose all of the lug nuts. Be careful because the front of your vehicle is on jack stands. Now place your 2 and 1/2 ton floor jack under the back of the car. You want to either jack using an axle if your vehicle is rear wheel drive, or if it is not then there are either the suspension links or sometimes there is a place where the suspension links come together in the middle on the rear of a front wheel drive vehicle. Now jack your vehicle up making sure the jack is not on something that is going to give. Now place your 3 Ton jack stands under either the axle in the back, or the suspension links. They are both located inside of the tires and should be heavy duty and connected to the tires. Make sure to lower the car onto the jack stands making sure the tires are off the ground and the car will not fall. Next remove all of the lug nuts off of every tire and set them aside. Now take the tires off and set them on the ground next to where they came off. Now to rotate your tires there are different discussions on which way to swap the wheels, but this is what my college professor taught me, and he said that most garages do it this way. You take the two wheels that are the drive wheels and move them straight back on the same side. Say your vehicle is front wheel drive; you will move the left front tire to the left rear, and the right front to the right rear. Then take your non drive wheels and cross them. So on the same front wheel drive vehicle you would take the back left wheel to the right front, and the back right wheel to the left front. Set your wheels on the ground next to the proper side and location. Now start with one wheel and lift it onto the hub. This is the thing with the bolts sticking out. Make sure to push it all the way back. Take your lug nuts and screw them on by hand. Make sure they go on easy, if they don’t then do not force them your wheel may be on crooked or you may have your nuts going on crooked. Move onto all of the other wheels doing the same and screwing the lug nuts on by hand. Next you will want to take your ratchet and socket and tighten the lug nuts in a criss cross pattern. Almost like a star shape. Tighten them pretty tight for now just so the wheel is on good. Now take your 2 and 1/2 ton floor jack and raise the back of the vehicle off the jack stands and remove them. Do the same for the front. Now the last part is tightening all of your lug nuts all the way. The correct way to do this is to use a torque wrench, such as this one 1/2″ Square Drive Torque Wrench ATD 20-150 ft. lbs. Please note this torque wrench is ½ inch drive so you will need a ½ inch socket to fit it. You can get away with not using a torque wrench though. NEVER USE AN IMPACT WRENCH TO TIGHTEN LUG NUTS THOUGH. You can use the impact to get them started, but not to tighten them. Impact wrenches are capable of tightening nuts to 400+ ft. lbs. The torque specification on the average lug nut is about 100 ft. lbs. To tighten your lug nuts without using a torque wrench you will need to make sure to tighten the nuts in the criss cross pattern. You will then want to tighten them till it starts to slow way down when you turn it and you can feel it get tight. You do not need to crank on them just pretty tight. Make sure to tighten all of the lug nuts using about the same force as you have on the previous. I would recommend using the torque wrench and looking up the specification in the service manual, but if you are not willing to spend the money you can get by without. Now you are done with your tire rotation. Just think you saved yourself some money. Sure you may have spent some money on tools, but after a couple rotations on your own they will easily pay for themselves. Just keep track of your rotations and tire balancing. 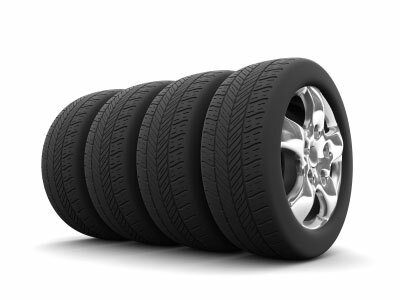 Make sure to rotate your tires ever 6,000-8,000 miles and balance them every 12,000-15,000 miles. This entry was posted on Thursday, September 17th, 2009 at 6:40 pm	and is filed under Tires. You can follow any responses to this entry through the RSS 2.0 feed. You can leave a response, or trackback from your own site.